EA has confirmed we'll be seeing a third Dead Space game. 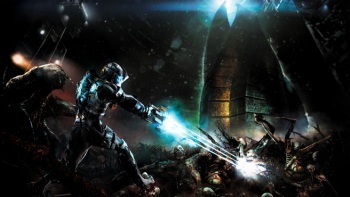 Today, EA confirmed that Dead Space 3 is in development and is set for a March 2013 launch date. Now that isn't surprising, as Dead Space 2 was a critical and commercial success, and EA really loves at least one of those. What's more surprising is that, if the rumors floating around IGN are true, the game will feature co-op. According to the IGN report, adding a second player to the mix changes the story. While (yet another) dead body might push notoriously unstable protagonist, Isaac Clarke, into a psychological breakdown if he's on his own, that breakdown won't occur if there's another character there to tell him to pull himself together. Players will also be able to share ammo and healing items, but there's no revive system. If one player gets eaten then it's back to the checkpoint for both of them. The other rumors are a bit of a mixed bunch. Apparently, the game will step away from the tight corridors of its predecessors in exchange for a snow-blown terrestrial setting. Earlier rumors from Siliconera pegged the planet as Tau Volantis. Changes have been made to the plasma cutter, meaning I may have to use a different weapon at some point in the game. Isaac can now crouch, and the dreaded "cover" word reared its ugly head. IGN also mentions that the game will introduce heavily armed human adversaries. Oh dear. EA is expected to share more details about Dead Space 3 and the upcoming Need for Speed game at E3.